Parmesan Smashed Potatoes are fluffy on the inside and crispy on the outside for a seriously addicting side dish. They might not be the prettiest spuds on the block but they sure are one of the tastiest! Parmesan smashed potatoes are one of my favorite side dishes to make for our holiday gatherings at home. Along with slow cooker green bean casserole, they’re on our Thanksgiving Day menu every year. 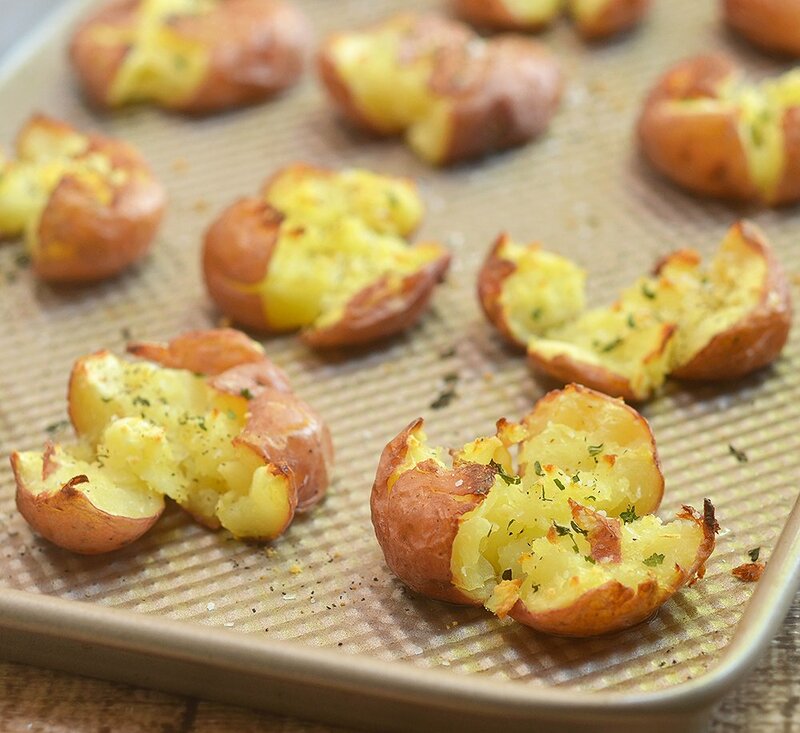 These crash hot potatoes are so easy to make for everyday family dinners yet impressive enough for special occasions. 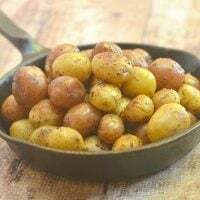 With fluffy centers, crunchy edges, and a good sprinkling of Parmesan cheese and herbs, this potato side dish is guaranteed to please even the pickiest eaters at the table! It’s easy to make for a large party and can be prepped ahead of time. Just boil the potatoes until fork-tender a day before and then smash and roast at the day of the event. It’s customizable! Feel free to amp up the flavor with fresh minced garlic, Ranch seasoning, shredded cheeses, gourmet sea salts or any of your favorite spice blends. Like our twice-baked potatoes, these smashed red potatoes with Parmesan require a two-step cooking process. First, the red potatoes are either boiled, baked, or steamed until fork-tender but not falling apart. After they’re coated in olive oil, “smashed” into discs and seasoned with spices, they’re roasted in the oven until beautifully browned and crisp. 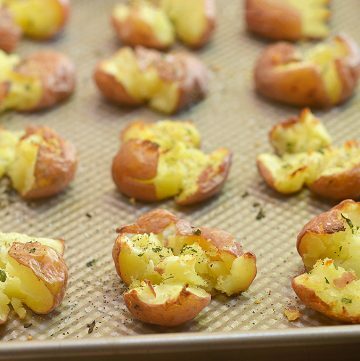 Arrange them in a single layer on a baking sheet, add more or less a cup of water, cover tightly with foil and then bake until a knife inserted in the center of potato slips in and out without resistance. 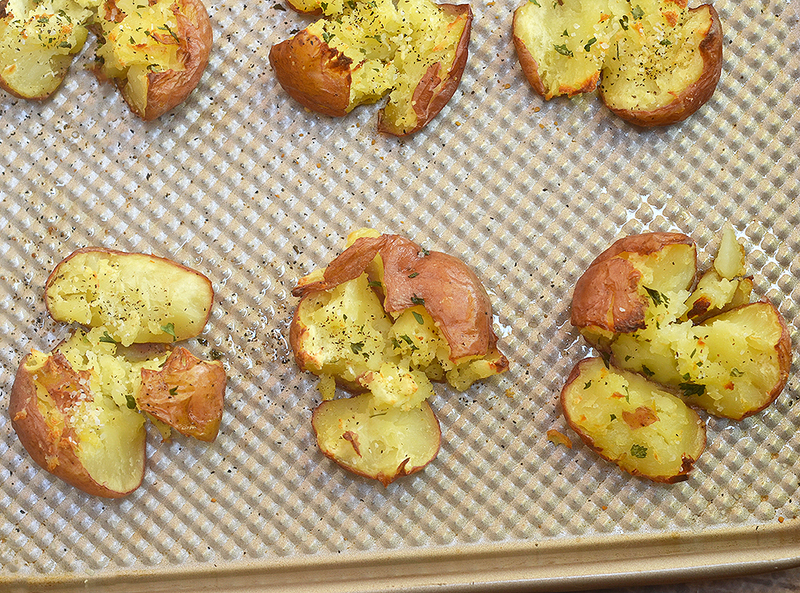 This is an easy one-pan method as you can just smash and roast the potatoes on the same baking sheet. Bring a pot of salted water to a boil, add the potatoes and cook until fork-tender. Drain the potatoes well and proceed to the second step of the recipe. This is the method I use when I am serving a large crowd and want to prep the potatoes ahead of time. Microwave the potatoes for about 6 to 8 minutes or until fork-tender and proceed to the next step. I often stock up on microwave-ready baby potatoes as I can just stick the whole bag in the microwave and have the potatoes ready to roast in minutes. Place potatoes in a steamer basket and set over a pot of boiling water. Cover the pot and steam for about 15 to 20 minutes or until fork-tender. This is also a method I like to use when I want to prep the potatoes ahead of time. I keep the steamed potatoes in the refrigerate and just smash and roast them on the day of the event. Smashed red potatoes might not be the prettiest side dish but they sure are one of the tastiest. Fluffy on the inside and crunchy on the outside, they are seriously addicting! Adjust oven racks by placing each on the top and lowest position. 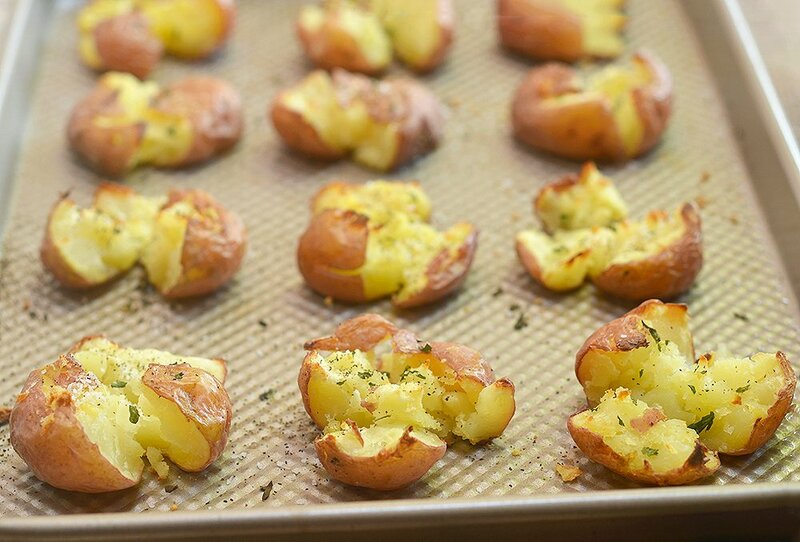 Heat oven to 450 F.
On a rimmed baking sheet, arrange potatoes, add water and wrap tightly with aluminum foil. Cook on the lowest rack for about 25 to 30 minutes or until a knife inserted in the center of potato slips in and out easily. 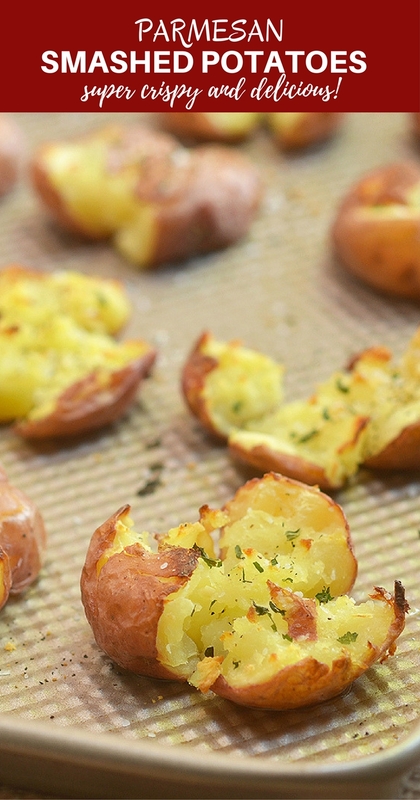 Remove foil and let the potatoes cool for about 10 minutes. Blot dry any remaining water on the baking sheet with paper towels. 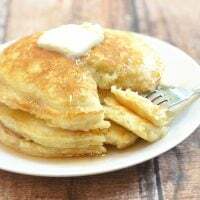 Drizzle 3 tablespoons of oil over potatoes and roll to coat. Allow space between potatoes and with a potato masher, flatten them into disks. 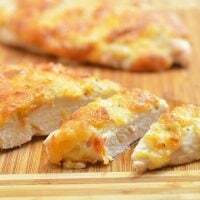 Sprinkle with thyme and Parmesan cheese. Season with salt and pepper to taste. Drizzle remaining oil evenly over potatoes. Transfer baking sheet to top rack and roast for 20 to 30 minutes or until the potatoes are lightly browned and crispy. Serve hot. 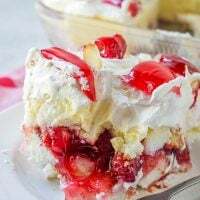 Looks very delicious and beautiful. Sweet potato is the kind of fruit that is delicious. I’m thinking how can you make such a beautiful color?